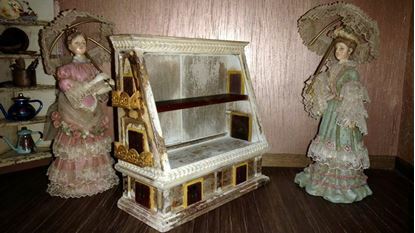 This scale is used to furnish a dollhouse dolls dollhouse. 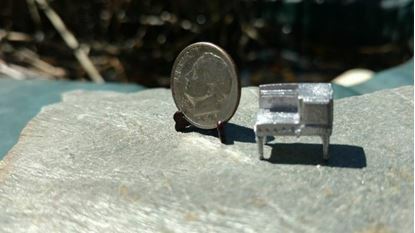 It is a super tiny scale. Dollhouse metal miniature accessory. These old pewter pieces are unpainted need to be deburred, and washed before painting. This sale is for a raw metal piece that will need to be finished by you. Measures 3/8" h x 7/16" w x 1/4" d. Photos show one painted and one unpainted. You will receive the one that is not painted. 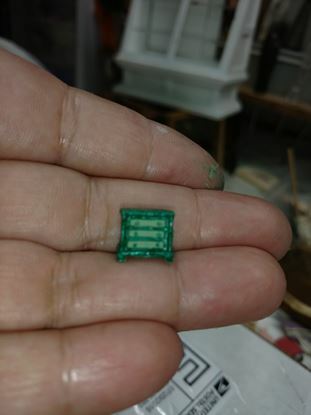 Dollhouse metal miniature accessory. These old pewter pieces are unpainted need to be deburred, and washed before painting. This sale is for a raw metal piece that will need to be finished by you. Measures 3/8" h x 1/2" w x 1/4" d. Photos show one painted and one unpainted. You will receive the one that is not painted. 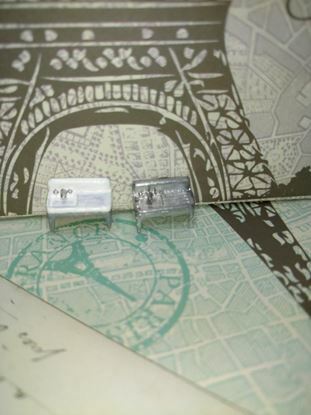 The photo shows one that has been painted but the one you will receive will be plain metal. These old pewter pieces are unpainted need to be deburred, and washed before painting. This sale is for a raw metal piece that will need to be finished by you. Measures 3/8" h x 7/16" w x 1/4" d. Photos show one painted and one unpainted. You will receive the one that is not painted. 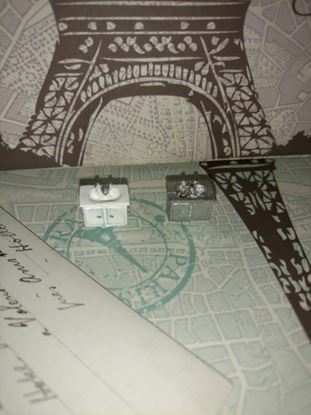 I made this house from card stock and furnished it with old pewter miniature furniture. The house measures 3 3/4" tall x 3" across including the base, and 3" deep. The doors do not close, they are in a fixed position and the furniture is glued in. If you remove the furniture the house will probably get ruined. This is a display case that can be used for 1/144 scale miniatures, or a display for any miniature you can imagine inside. It would be nice in a general store to display food or what not, but it also makes a great 144th scale apartment. I added balconies, faux doors, a different interior shelf. And, I completely redid inside & out to resemble and old rustic building. This piece measures 4 1/2" high x 4 1/4" across x 2" deep. No accessories are included with the cabinet. Dollhouse metal miniature accessory. These old pewter pieces need to be deburred, and washed before painting. This sale is for a raw metal piece that will need to be finished by you. 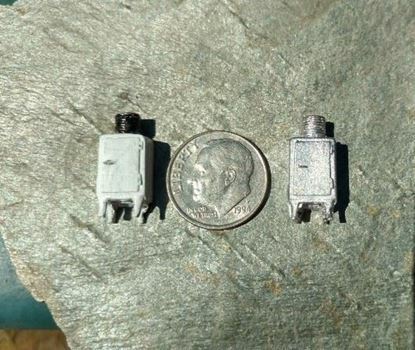 Measures 3/8" h x 1/4 w x 3/8" d.
Dollhouse metal miniature accessory. These old pewter pieces need to be deburred, and washed before painting. This sale is for a raw metal piece that will need to be finished by you. 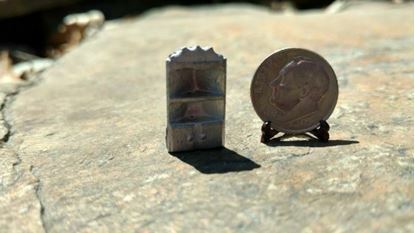 Measures 1" h x 1/2 w x 3/16" d.
Dollhouse metal miniature accessory. These old pewter pieces need to be deburred, and washed before painting. This sale is for a raw metal piece that will need to be finished by you. Measures 1/4" h x 3/8 w x 5/8" l. Table only. 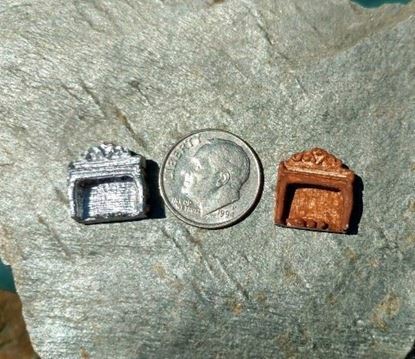 Dollhouse metal miniature accessory. These old pewter pieces need to be deburred, and washed before painting. This sale is for a raw metal piece that will need to be finished by you. 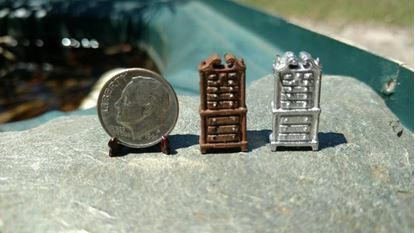 Measures 1/4" h x 5/16w x 3/4" l.
Dollhouse metal miniature accessory. These old pewter pieces need to be deburred, and washed before painting. This sale is for a raw metal piece that will need to be finished by you. 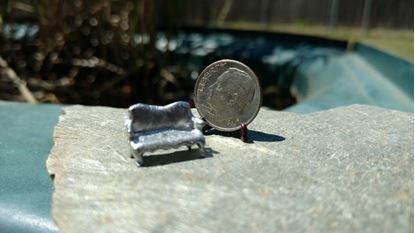 Measures 1/2" h x 1/4w x 1/2" l.
Dollhouse metal miniature accessory. These old pewter pieces need to be deburred, and washed before painting. This sale is for a raw metal piece that will need to be finished by you. 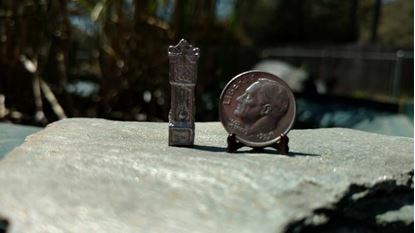 Measures 1/2" h x 1/2 w x 3/16" d.
Dollhouse metal miniature accessory. These old pewter pieces need to be deburred, and washed before painting. This sale is for a raw metal piece that will need to be finished by you. 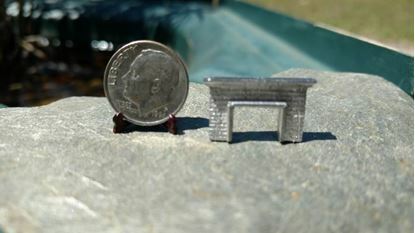 Measures 1/2" h x 3/4" w x 3/16" d.
Dollhouse metal miniature accessory. These old pewter pieces need to be deburred, and washed before painting. This sale is for a raw metal piece that will need to be finished by you. 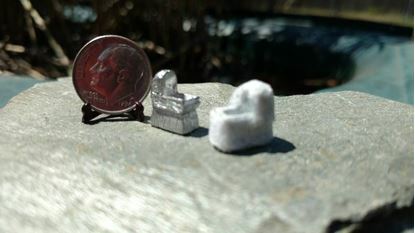 Measures 1/2" h x 3/4" w x 1/4" d.
Dollhouse metal miniature accessory. These old pewter pieces need to be deburred, and washed before painting. This sale is for a raw metal piece that will need to be finished by you. 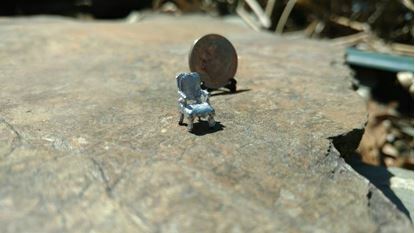 Measures 7/8" h x 3/8" w x 1/4" d.
Dollhouse metal miniature accessory. These old pewter pieces need to be deburred, and washed before painting. This sale is for a raw metal piece that will need to be finished by you. 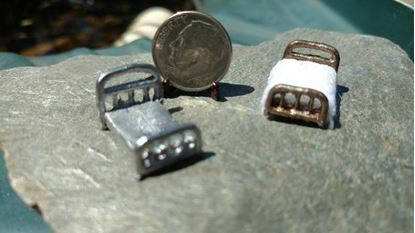 Measures 3/4" h x 3/8" w x 1/4" d.
Dollhouse metal miniature accessory. These old pewter pieces need to be deburred, and washed before painting. This sale is for a raw metal piece that will need to be finished by you. 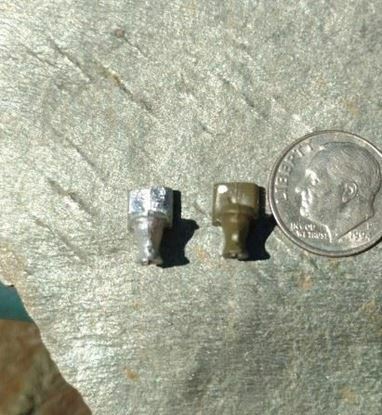 Measures 1/2" h x 1/2" w x 1/4" d.
Dollhouse metal miniature accessory. These old pewter pieces need to be deburred, and washed before painting. This sale is for a raw metal piece that will need to be finished by you. 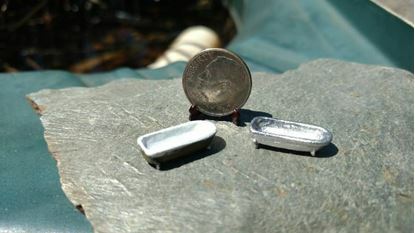 Measures 7/8" h x 3/4" w x 1/2" d.
Dollhouse metal miniature accessory. These old pewter pieces need to be deburred, and washed before painting. This sale is for a raw metal piece that will need to be finished by you. 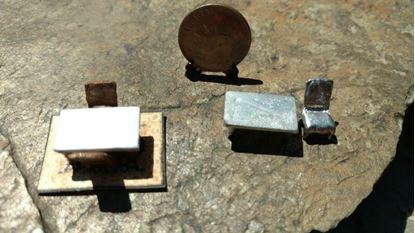 Measures 1/2" (head)" h x 1/4" w x 1/2" l. Image shows one finished and one unfinished. 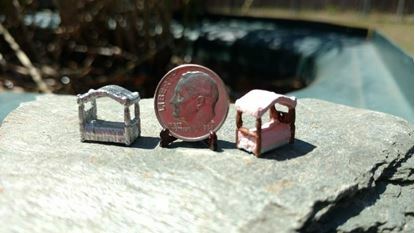 Dollhouse metal miniature accessory. These old pewter pieces need to be deburred, and washed before painting. This sale is for a raw metal piece that will need to be finished by you. Measures 1/2" (headboard)" h x 1/2" w x 3/4" l. Image shows one finished and one unfinished. 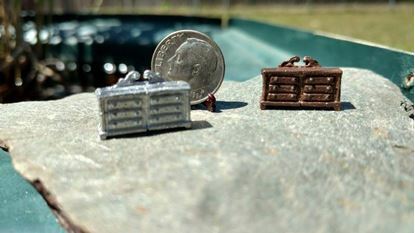 Dollhouse metal miniature accessory. These old pewter pieces need to be deburred, and washed before painting. This sale is for a raw metal piece that will need to be finished by you. Measures 7/8" h x 1/5" w x 1/4" deep. 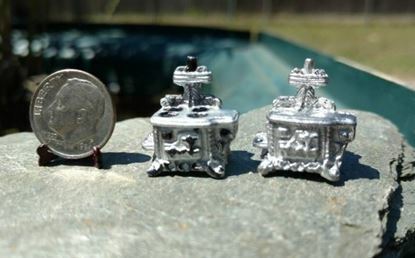 Dollhouse metal miniature accessory. These old pewter pieces need to be deburred, and washed before painting. This sale is for a raw metal piece that will need to be finished by you. Measures 1/4" w x 3/8" h x 1/4" deep. Sale is for 1 chair with arms. Sale is for one chair, unpainted. It's the one on the far right in the photo. Dollhouse metal miniature accessory. These old pewter pieces need to be deburred, and washed before painting. This sale is for a raw metal piece that will need to be finished by you. Measures 5/8" l x 3/8" h x 1/4" deep. Sale is for 1 chair w/o arms. Dollhouse metal miniature accessory. These old pewter pieces need to be deburred, and washed before painting. This sale is for a raw metal piece that will need to be finished by you. Measures 5/8" l x 3/8" h x 1/4" deep.